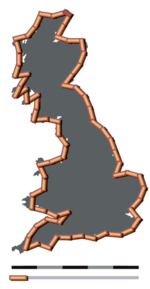 An example of the coastline paradox. 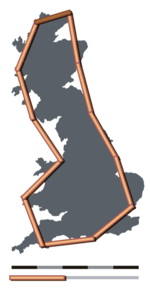 If the coastline of Great Britain is measured using a scale interval of 200 km (left), then the length of the coastline is about 2400 km. Using a scale interval of 50 km (right), the length of the coastline is about 3400 km. The coastline paradox states that a coastline does not have a well-defined length. Measurements of the length of a coastline behave like a fractal, being different at different scale intervals (distance between points on the coastline at which measurements are taken). The smaller the scale interval (meaning the more detailed the measurement), the longer the coastline will be. [Note 1] This "magnifying" effect is greater for convoluted coastlines than for relatively smooth ones. Treated as fractals, coastlines can however be measured. For example, the coast of Great Britain has a size of about 28000 km1.43, which is called its Hausdorff measure. Data marked The World Factbook or TWF covers 198 countries and 55 territories, from the book published by the Central Intelligence Agency. In addition to coastline lengths, this is the source of the land area used to calculate the "coast/area ratio" for both TWF and WRI (see below) coastline measurement. This ratio measures how many meters of coastline correspond to every square kilometer of land area. The ratio illustrates the ease of accessibility to the country's coast from every point in its interior. Therefore, an island country like Maldives, or a country carved by the sea like Greece, is more likely to have a high ratio, while a landlocked country will have a ratio of zero. Note that the scales at which The World Factbook figures were measured are not stated, nor is it known whether the figures are all reported using the same scale, thus the figures are not necessarily comparable across different countries. Data marked World Resources Institute or WRI covers 182 independent countries and 13 dependencies, based on data calculated in 2000 from the World Vector Shoreline, United States Defense Mapping Agency, 1989. It may include territories whose status have changed. According to their technical notes, the "coastline length was derived from the World Vector Shoreline database at 1:250,000 scale. The estimates (...) were calculated using a Geographic Information System (GIS) and an underlying database consistent for the entire world. The methodology used to estimate length is based on the following: 1) A country's coastline is made up of individual lines, and an individual line has two or more vertices and/or nodes. 2) The length between two vertices is calculated on the surface of a sphere. 3) The sum of the lengths of the pairs of vertices is aggregated for each individual line, and 4) the sum of the lengths of individual lines was aggregated for a country. In general, the coastline length of islands that are part of a country, but are not overseas territories, are included in the coastline estimate for that country (e.g., Canary Islands are included in Spain). Coastline length for overseas territories and dependencies are listed separately. Disputed areas are not included in country or regional totals." ^ The smaller the scale interval mathematically, the more detailed and the "greater the scale of the map", in common usage. See scale (map). ^ World total includes countries not listed and coastline for disputed areas. ^ 95 nations and other entities are islands that border no other countries. For the list, see the reference below: "CIA World Factbook: Coastline". ^ Greenland is an autonomous country within Denmark. ^ Russia has an additional 850 km of coastline along the Caspian Sea, which is landlocked. ^ Includes coastline length for the Canary Islands. ^ Excludes minor outlying islands. ^ Iran has an additional 784 km of coastline along the Caspian Sea, which is landlocked and Including 30 islands in the South and North Islands. ^ Does not include Île Saint-Paul and Îles Crozet (data unavailable) or Adelie Land claim to Antarctica. ^ Includes coastline in the Gulf of Fonseca (163 km). ^ In 1900, the Dutch coastline measured approximately 1400 km. It has significantly been reduced by the closing of the Zuiderzee by the Afsluitdijk in 1932 (250 km) and the closing of several sea arms by the Delta Works (700 km). ^ Israel has an additional coastline along the Dead Sea and the Sea of Galilee (both landlocked), with a total length of 63 km. ^ Excluding Ascension Island (data unavailable). ^ Figure represents coastline of entire island, including Sint Maarten (administered by the Netherlands). ^ Jordan has an additional 50 km of coastline along the Dead Sea, which is landlocked. ^ Coastline included in figure for Saint Martin (administered by France). ^ Kazakhstan has a coastline with the Caspian Sea, which is landlocked, with a total length of 1,894 km. ^ Turkmenistan has a coastline with the Caspian Sea, which is landlocked, with a total length of 1,768 km. ^ Azerbaijan has a 713-km coastline along the Caspian Sea, which is landlocked. ^ The West Bank has a 40-km coastline along the Dead Sea, which is landlocked. ^ a b "Coastal and Marine Ecosystems — Marine Jurisdictions: Coastline length". World Resources Institute. Archived from the original on 2012-04-19. Retrieved 2012-03-18. ^ a b Includes coastline of outlying islands. ^ a b c Figure represents total area rather than land area. Eric Bird (2011). "1.5 Coastline length". Coastal Geomorphology: An Introduction. John Wiley and Sons. ISBN 978-1-119-96435-3.